what's the best ball head for your tripod? There are several resources for getting the best ball head reviews. I personally have 3 different heads and I do like all of them for different reasons. When I first got into photography in the 1970s, ball heads were not popular and I personally didn't even know they existed. The only tripod heads I knew about were pan-tilt heads. If you have an interest in high end (pricey and top-notch quality) dpreview recently evaluated some of the premium models in a well written article on their web site. For the large majority of photographers who read Better Digital Photo Tips this level is overkill. 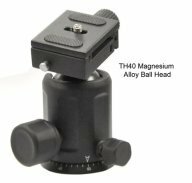 You still might want to read the article to learn about what to consider when looking for the best ball head for your situation. The link to this article will open up in a new window so you can stay on this page while you read it: Top Ball Heads. Here is a short video on what to look for when buying a ball head. It shows what features are important to pay attention to. 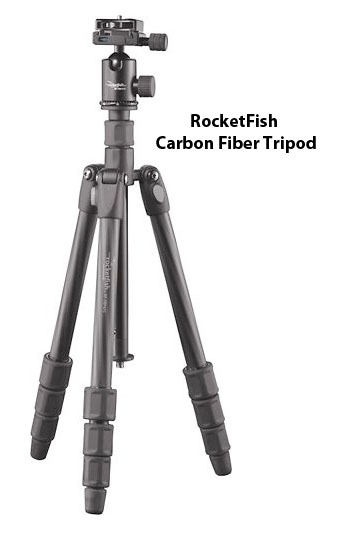 One of my ball heads came with this Rocketfish Carbon Fiber Tripod pictured on the left. I use this combination when I am hiking or backpacking and need to travel light. It was extremely affordable to obtain. It does not work perfectly when I am shooting with my full-sized DSLR and a real heavy lens but I am very careful and can make do okay in most situations like this. A tripod lens collar is a must when you are shooting with a big lens. 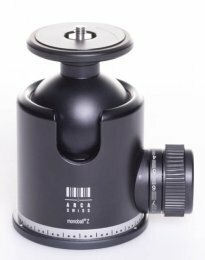 My articles generally are best for the amateur and advanced hobbyist photographers who do want the best camera accessories but don't have an unlimited budget to invest in camera equipment. The quickest ball heads to use are the pistol grip style. I've used this Manfrotto 222 head for many years with portrait photography. Just a squeeze of the trigger loosens the hold. Adjust your composition in the x, y, or z plane. Release your grip and you are all set. 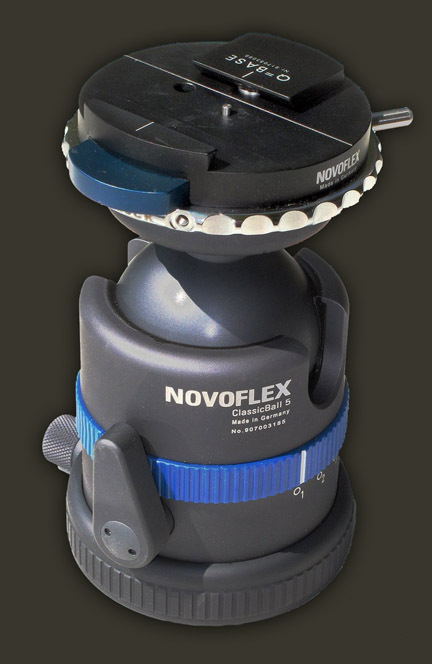 It also has a quick release plate which gives you the ability to attach or remove your camera from the tripod quickly. This is really a common sense kind of discussion. The larger the size of the ball the better the stability and capacity of the ball head. Heavy duty heads are for heavy camera and lens combinations. Reading the reviews of a bunch of different photographers is a good way to figure what's the best ball head for your tripod. Tiny "mini" ball heads like the one picture in the left column are for compact cameras only. You don't want to risk your dslr toppling over from a budget ball head. 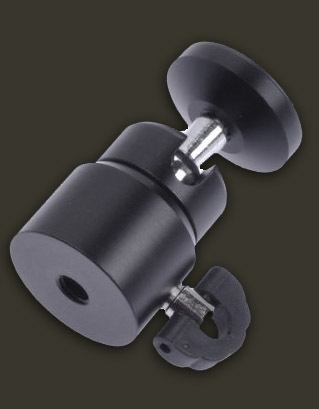 The premium heavy-duty heads can weigh as much as 2 pounds and the mini ball heads only weigh a few ounces. Ball heads are extremely easy to use with small and compact cameras. It is simply to adjust the camera with one hand and loosen/tighten the locking knob with the other. They are also better to use than pan-tilt heads when you need to make quick adjustments. Loosen the knob, adjust vertical, horizontal, and rotational directions, and tighten. Ball heads are least valuable as macro photography equipment when small adjustments are magnified by the very close working distances. They are not good for use with extremely long lenses used in bird photography and wildlife photography unless they are balanced just right to avoid being top heavy. Many video photographers prefer the long handles that come with with pan-tilt tripod heads to more accurately and smoothly change the camera angle to follow the subject or create visual interest with motion. The manufactures listed maximum weight capacities are almost worthless. There are no standards used among manufacturers and there are too many variables. 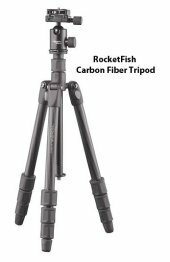 The tripod legs you choose to use need to be figured into the equation also. It is one of the reasons to avoid comparing ball heads just by looking at the numbers. Looking at user experiences with any camera accessory is always a wise thing to do. I have been a shooting pro for over 30 years so I believe my opinion does provide real value to my readers. For a wider view of reactions and opinions it makes sense to use a source of many ball head reviews in one location. A strategy I employ often is to read the 1 and 2 star reviews first. This gives me an idea on what issues I should be aware of. Some of these "negative" reviews can be dismissed right away because the bad reviews are sometimes caused by a delivery issue. Sometimes the buyer did not read the description very carefully and bought the wrong item or the gripe is about a feature that is completely meaningless for what you are concerned about. Everyone has their own preferences for sure, but certain accessories are more appropriate in certain photography situations. After 40 years of using tripods and monopods, I am a full-time ball head user with the one exception of macro photography where minute adjustments in just one of the one vertical, horizontal or rotational axis is desirable and my pan-tilt-swivel head is a better choice.